The mild winters in Arizona allow you the luxury of having a beautiful green lawn all year. Bermuda grass is the top choice as a warm season grass. When winter comes, it goes dormant and turns brown, so it is overseeded with rye grass, a cool season variety. Arizonans start their Bermuda grass lawns in the spring when temperatures warm into the 80s degrees F. The winter lawn is started at the end of summer, when daytime highs are in the high 80s to low 90s degrees F and the nights cool down into the 60s, early to mid October. Select Bermuda for a summer lawn that can survive the heat and long hours of intense Arizona sunlight under cloudless conditions. Choose zoysia if you want a grass that is more tolerant of shade than Bermuda. Be aware zoysia grows more slowly. St. Augustine grass grows well in yards that get lots of shade from trees or fences. 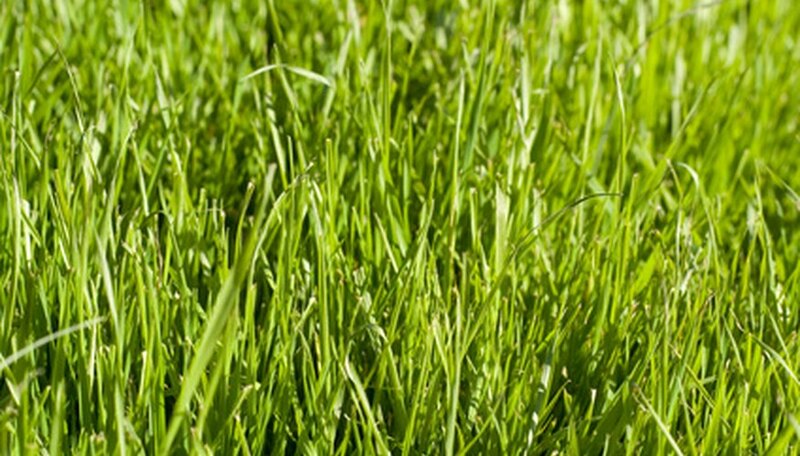 For your winter lawn, plant rye grass each year. Turn the entire planting bed several times with a shovel. Go down at least 6 inches. Use a rototiller if the soil is unusually hard. Break up stubborn compacted areas with a garden fork. Remove rocks and plant debris as you go. Work 2 to 3 inches of compost into the planting bed to add organic matter to the Arizona soil, which is typically lacking in nutrients. Add gypsum to counteract alkalinity. Incorporate fertilizer with nitrogen, phosphorous and potassium, all of which are needed for growing a healthy lawn. If the soil is loose and crumbly, you are ready to start your lawn. Rake the planting bed until it is smooth and level. Pull the rake down the length of the planting bed, and then across the rows you just raked. A bed that is not level allows pools of water to collect and drown the grass seeds. Buy or rent a push spreader rather than depending on sowing by hand. Spread the seeds in one direction, and then go across those rows, creating a checkerboard pattern. Cover the seeds with a layer of compost no more than ¼ inch thick. Install an irrigation system to water the lawn. Consistent watering is critical when you start the lawn and to keep it healthy during the stress of the summer heat in Arizona. A permanent irrigation system is preferable to attaching a sprinkler to a garden hose. Use plastic irrigation tubing and pop-up lawn sprayers. Make sure you calculate how far apart they need to be for the entire area to receive water, before connecting them. Water the lawn for eight to 10 minutes at least three times day for the first three weeks. Water more frequently if the weather is hotter, drier or windier than expected. Try not to walk on the grass until it is well established enough to mow, when it is at least 2 inches high. Birds searching the Arizona desert for food have an uncanny ability to find grass seed. They are bound to consume some as soon as you have planted it. Allow for this by spreading 10 percent more seed than the package recommends. To be successful planting an Arizona lawn, do not let grass seed dry out or it will not germinate. Check the lawn several times each day to make sure it is moist or have the irrigation system on a timer. Putting in a lawn in Arizona during the hottest part of the summer--when temperatures soar above 105 degrees F--can result in the new grass burning out before the root system is established.